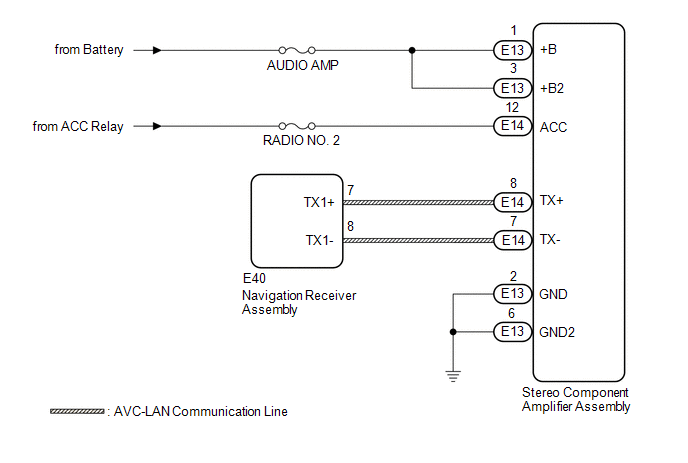 The navigation receiver assembly and stereo component amplifier assembly are connected via AVC-LAN communication. This DTC is stored when an AVC-LAN communication error occurs between the navigation receiver assembly and stereo component amplifier assembly. The navigation receiver assembly is the master unit. (a) If DTC B15C3 is output, perform the troubleshooting for DTC B15C3 first. DTC B15C3 is not output. (a) Check that optional components (including associated wiring) which generate radio waves are not installed. Optional components (including associated wiring) are installed. Optional components (including associated wiring) are not installed. Electrical noise from radio waves generated by optional components or the wiring for those components may affect AVC-LAN communication. This DTC may be stored when an AVC-LAN communication error occurs due to electrical noise. (a) Remove optional components (including associated wiring). Do not remove optional components or associated wiring without the permission of the customer. (a) Disconnect the E13 and E14 stereo component amplifier assembly connectors. (a) Disconnect the E40 navigation receiver assembly connector. (a) Replace the stereo component amplifier assembly with a new or known good one (See page ).